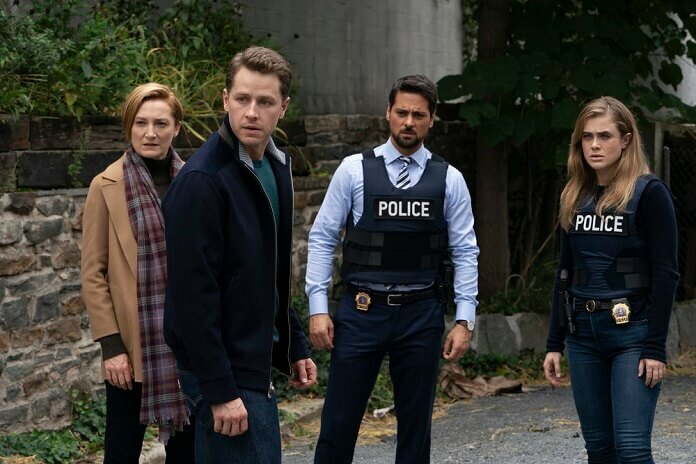 'Manifest' Season 1 Episode 9 Recap: "Dead Reckoning"
“I’ve got a missing passenger in my garage,” says Ben (Josh Dallas) to his sister, Michaela (Melissa Roxburgh), during a phone conversation in season one episode nine of NBC’s hit dramatic series, Manifest. Season one episode nine kicks off with the passengers of Flight 828 being interrogated after getting off the plane. One passenger named Autumn Cox (Shirley Rumierk) is handed over to the police by the NSA because of outstanding warrants. Autumn pleads it’s all a big misunderstanding. Flash-forward to present day and NSA Director Vance (Daryl Edwards) is trying to calm down Ben who wants to go looking for the missing 11 passengers now that they’ve discovered their location. Vance insists he has to put together a strike team and they need to be careful not to alert the scientists or they’ll just take off and relocate again. Michaela explains she’s going to the precinct to investigate Lawrence Belson, the man who seems to be running the science team performing the experiments. Vance suggests Ben spend time with his family, especially given it’s Saturday. He’ll call if anything happens. Ben goes home and spends time with Cal (Jack Messina) shooting hoops. As they’re enjoying the day, Autumn Cox walks up, limping. Ben notices her and tells Cal to take a break. As Ben approaches, she collapses while saying his name and insisting she needs help. Ben calls Michaela and alerts her to what just happened. Michaela tells him he needs to take Autumn somewhere safe and suggests the boiler room. She also tells her brother she’ll meet him there. Autumn confirms to Ben she was hooked up to machines and whoever held them were doing tests. She escaped from a van and a voice told her to find him. Before Michaela can leave, Jared Vasquez (J.R. Ramirez) asks if she’s okay. If she’s in any danger he wants to know immediately. Michaela assures him everything’s fine. Dr. Saanvi Bahl (Parveen Kaur) and Professor Fiona Clarke (Francesca Faridany) meet up with Ben at the boiler room to talk to Autumn. Ben’s sure they need to bring in Vance on this. The rest are hesitant but finally agree. Vance joins them in the boiler room and Ben reveals details on The Calling. Vance has a hard time believing it and asks Autumn what she remembers about the location of the experiments and how much Belson knows about them. Ben becomes impatient and tells Vance they need to go now and save the 11 passengers. Vance tries to calm him down, but Ben confesses Cal’s connected to one of the patients and he feels the pain of the tests on the poor tortured passengers. Over at the secret location, the scientists and Belson start up the testing again. Michaela, Saanvi, Cal, and Ben all grab their heads as they feel the pain from the electroshock treatments administered on the passengers. It stops and Vance is shocked by what just happened. After the pain ends, Ben calls Olive (Luna Blaise) to have her go check on Cal. She knocks on his door and he says he’s busy. Ben tells her to go in and Cal is drawing. Cal sends his sister away without looking at her. Olive leaves the room without realizing Cal has a nosebleed. Vance agrees to put together a team and will text Ben the rendezvous point. Jared checks on Michaela and she’s about to leave. He insists he’s going with her. Over at Ben’s house, Grace (Athena Karkanis) is hosting a barbecue party for her friends and keeps calling Ben’s phone which goes straight to voice mail each time. Two men in suits invade her party and demand to speak with her husband. She believes he’s at work and they reveal Ben was let go from his position the day before. Vance, his team, Jared, and Michaela storm the warehouse where they believe the passengers are being kept but find nothing. Outside, Jared’s about to get into an argument with Vance when Cal shows up telling Ben the missing passengers are there. He points to his coloring picture showing a building off to the side of the warehouse. Cal insists it’s just like how he knew about the subway tunnels; he just knows. After Vance and his team find the secret building, Cal insists his dad is the only one who can see them and he has to follow Vance inside. Vance, Jared, Vance’s ops team, Ben, and Professor Clarke head inside. Michaela remains outside to keep Cal safe. A short way in Vance and his ops team become involved in a shootout with armed guards. Belson tells the scientists to evacuate and destroy what they can’t take with them. He then turns the electroshock on to kill the 11 passengers. Vance and his men break through to the lab and chase after Belson and the scientists. Ben, reacting to the pain of the electroshock the passengers are enduring, starts to unhook each one from the electrodes. Back at Ben’s house, Olive is near panic when she tells Grace that Cal has disappeared. Back at the warehouse, Ben leads what’s left of the 11 passengers, Professor Clarke, and a few ops through a tunnel where only Ben sees lights on the floor showing the path out. They follow him and escape outside. Jared, Vance, and Vance’s team capture Belson and his scientists. They’re searching for a way out when they wind up going in a circle. Their exchange of gunfire with the guards has caused a fire inside the lab. It reaches oxygen tanks and they explode. Michaela rushes in right after the explosion, however a second, larger explosion follows and it blows her outside. Ben’s also concussed by the explosion which knocks out windows on his car where Cal’s seated in the backseat. Ben manages to stand and after have a vision of a peacock, he checks on Cal. Cal’s fine and so Ben turns his attention to his sister. She’s bruised and cut but okay. Ben doesn’t want his sister to re-enter the building but Michaela insists she needs to find Jared. She heads back in as Ben leaves to take Cal home. Before he takes off, Professor Clarke tells Ben she has some land and she will take the 11 passengers there to keep them safe. Michaela finds Jared’s limp, motionless body lying inside a tunnel. Yelling that he can’t do this, she finds the strength to pull him out. A short while later, Michaela watches over Jared at the hospital. Their boss checks in on them, informing her it’s touch and go with Jared but Vance didn’t make it. He wonders how she and Jared ended up mixed up in a terrorist hunt and she lies and claims they received a tip. After he leaves, Michaela cries and speaks out loud, praying to whoever or whatever is behind The Calling. She says she has done everything it has asked of her and now she can’t lose Jared. She asks for him to be spared. Ben takes Cal home and Grace is extremely upset. Ben tries to talk to her but she shuts him down saying he’s changed and their marriage is not working. She wants him to leave and an upset Ben agrees saying he can’t give her what she wants. He wants to take Cal with him and she refuses, explaining she lost Cal before and she won’t lose him again. Ben says goodbye to Olive who was eavesdropping and is upset. He also says goodbye to Cal who gives him an understanding nod and gives him his stuffed alligator to take with him. Back at the hospital, Jared wakes up. Michaela says thank you out loud to whoever or whatever is in charge of The Calling. She gets Jared to open his eyes and then says she’ll go call his wife. He asks her not to and wants her to stay with him. She does. Later, Michaela finds Ben in the boiler room. He explains what happened between him and Grace and Michaela comforts him, telling him not to worry and that they’ll find their own place. Dr. Saanvi and Autumn Cox arrive for a visit, but then Dr. Saanvi has to head off to work. Autumn thanks Ben and Michaela again for everything they did. When Ben and Michaela take off to get Autumn something to eat, she removes a cellphone hidden in her sock and texts “What next” to someone. A flashback shows Belson instructing her to lie to Ben by creating a story that she escaped from the experiments. She’s been recruited to get close to Ben and learning who else he’s working with.